Researchers from the Federal Research and Clinical Centre of Physical-Chemical Medicine, and staff from MIPT’s Systems Biology Laboratory, the Research Institute of Phthisiopulmonology and the St. Petersburg Pasteur Institute, conducted a large-scale analysis of the proteins and genomes of mycobacterium tuberculosis strains that are common in Russia and countries of the former Soviet Union and found features that provide a possible explanation for their epidemiological success. A paper detailing the results has been published in the journal Scientific Reports. Up until the 20th century, tuberculosis was considered an incurable disease and, despite newly developed methods of curing it at its early stages, the death rate is still high. There are 22 countries, including Russia, in which the infection rate is four times greater than in the rest of the world. It is important to note that the term “tuberculosis” covers a wide range of bacteria strains that cause the disease. Strains of the Beijing family (this genotype was first discovered in Beijing) are prevalent in Russia - every year about 150,000 people are infected with it. To understand the reason behind the “success” of this strain, scientists compared proteins produced by Beijing B0/W148 with a control strain. In order to do this, separated bacterial proteins were enzymatically cleaved into smaller fragments – peptides and their mass and relative abundance were measured precisely using mass spectrometry. After analysing the data collected, the scientists knew which and how many proteins there were in each strain. It was found that in Beijing B0/W148 strains, 266 proteins were differentially abundant compared with the control strain. 57 of them were entirely absent in the study group and 17, on the contrary, were unique to it, others differed quantitatively. Analysis of the functions associated with differing proteins revealed that in Beijing B0/W148 strains there are more proteins producing long-chain fatty acids and less proteins destroying them. Bacteria use these acids to produce mycolic acids, which integrate themselves in the bacterial cell membrane and make it waxy, which is why mycobacteria can survive and even reproduce in macrophages (special human cells that destroy foreign substances). Normally, if a bacterium is “eaten” by a macrophage it dies. However, mycobacterium tuberculosis strains have evolved to reproduce in macrophages and in doing so they hide from the immune system. Mycolic acids not only protect bacteria, but also play a crucial role in synthesizing substances that inhibit macrophages so they stop fighting disease. 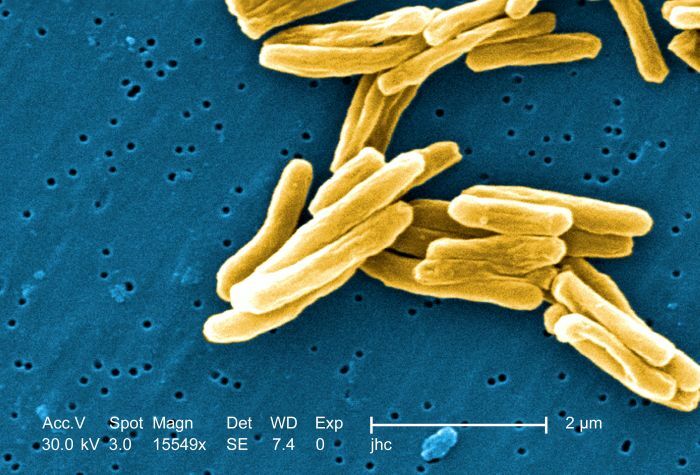 The features of lipid metabolism that have been discovered could explain the success of Beijing B0/W148 strains in relation to other tuberculosis mycobacteria.